The Mall At Columbia, Columbia Maryland, Tuesday afternoon January 27, 2014. After brief remarks by politicians, mall officials and police The Mall At Columbia reopened to the public. A shooting at The Mall on Saturday morning left Zumiez skate shop employees Brianna Benolo and Tyler Johnson dead along with shooter Darion Marcus Aguilar who turned the gun on himself. Photojournalists present at the reopening were corralled in the lower level Food Court by police and mall staff and were prevented from entering the upper level where the shooting had taken place. 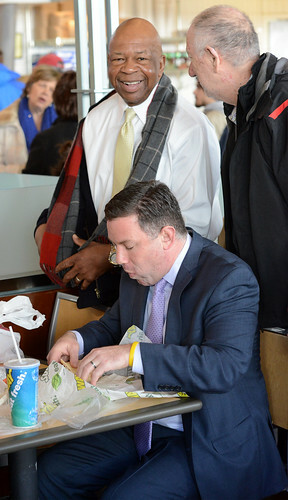 In this photograph Howard County Executive Ken Ulman has lunch in The Mall Food Court with aides and U.S. Representative for Maryland's 7th congressional district Elijah Cummings.